Nowadays external memory card’s capacity has been increased to cater for continuously increase higher resolution media files. And in order to provide reasonable transfer rate for huge media files, there is a need to have a higher bandwidth transmission path between the storage media and its host controller. 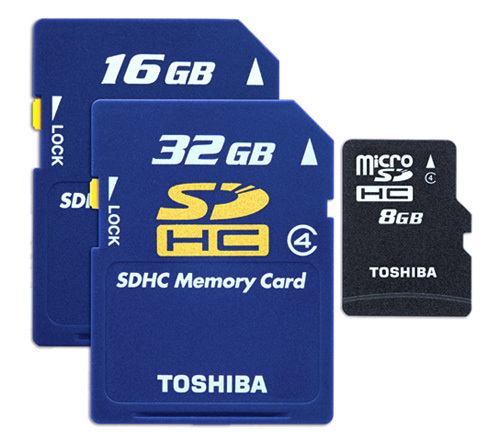 Just recently, Toshiba has disclosed a new SDHC memory cards that is compliant with UHS-I (Ultra High Speed I) standard. Dubbed as the world’s fastest SDHC UHS-I memory cards in the industry, the cards are capable to reach maximum data read and write rate at 95MBps and 80MBps respectively. The rate is almost four times as fast as conventional memory cards that topped at 25MBps and just imagine, a similar media files will only need a quarter of total time to get transferred and stored as compared to current solution. However, there seems to be no actual host controller that can utilize this except a USB 3.0 based card reader which is still very new in the market. Even though there isn’t any device or host controller that can utilize such SDHC cards at this moment, but this could be a great news for end users with backward compatibility to existing host controllers while getting ready for next generation products. No pricing information yet, there are a few variants ranging from 8, 16 and 32GB memory capacities available for selection with the official release timeline by December 2010. Meanwhile, a lower performance MicroSDHC cards at 4, 8 and 16GB are scheduled to arrive one month earlier in November 2010.